Appropriately enough, the Thurston County Bicycle Commuter Challenge, hosted by Intercity Transit, kicks off with the Earth Day Market Ride. Earth Day is the perfect time to commit to doing something positive for the environment – and taking a bicycle on the road instead of a car tops the list. In this series of articles, you will learn the ins and outs of bicycling to work, running errands with children in tow, and how you can best enjoy bicycling in this beautiful place we call home. In Part One, we covered tips for choosing a great bike for your needs and some first-hand advice on how to get involved. Read Part One here. 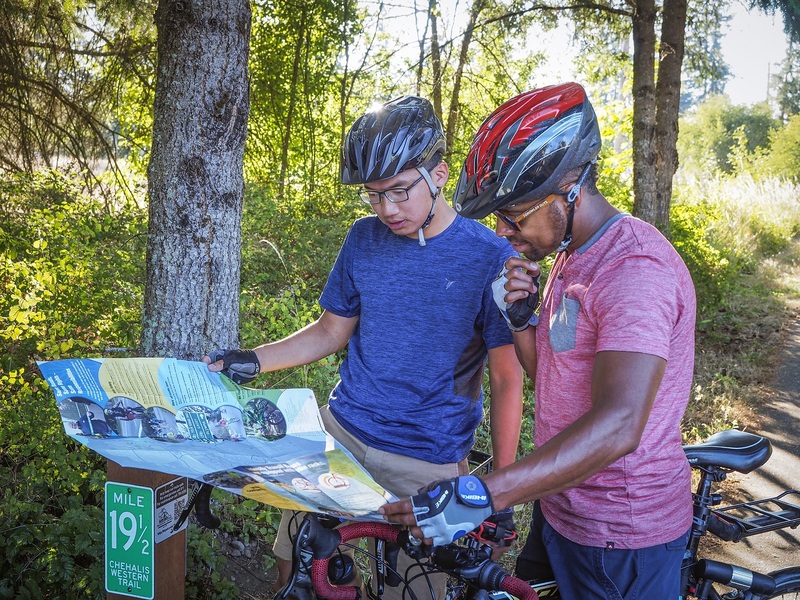 In this article, we focus on what it takes to be a successful bicyclist, namely, staying safe, getting where you want to go and enjoying a bit of scenery in the process by using the Thurston County Bicycle Map. “A helmet is the first thing that comes to mind for safety,” says Chris Hawkins of the Thurston County Health Department. “Even if you aren’t in a collision you can still fall over and that is five feet,” says Chris. And, a helmet also lets car drivers know that they are sharing the road with a bicyclist. 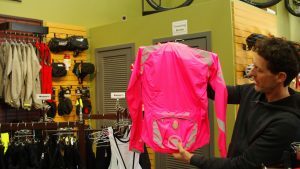 Joy Ride, and other local bike shops, carry a wide range of fluorescent jackets, shirts and vests. Lights for riding after dark or in overcast conditions are also very important to improve visibility on the roads. Then, once you are ready to ride, it is time to take a look at your bicycle. Get in the habit of walking around your bicycle before you start riding. Look for frayed brake lines, squeeze the brakes hard and make sure the lever does not go all the way to the handlebar. Check the tires and make sure they are inflated properly. Check the quick release on your wheels to make sure they are secure. Are your luggage straps dangling? Spending a few minutes doing this can make a difference in both your safety and the confidence you have in your bike. 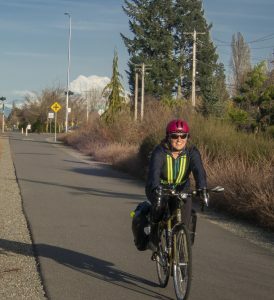 Paul Brewster, a senior planner at Thurston Regional Planning Council (TRPC), has spent years helping bicyclists and motorists share the road safely. “It is important that people who ride bikes follow the rules of the road just like a car would,” says Paul. “They need to ride predictably, use hand signals to tell others their intention and follow all traffic signs and signals.” Another tip is to try and ride in as much of a straight line as you can. One tip that Derik offers is for bicyclists to get into the mindset that they are vehicles too. “Thinking that they are an addition to the traffic,” he stresses, “being confident that they are a vehicle. Taking a lane confidently. And, if it is not safe for the car to pass, then the bicyclist moves over, to let them know.” And like a motorist, Derik also recommends that new bicyclists train themselves to scan the roads looking for potential danger and learn defensive riding tactics. A mistake many new bicyclists make is sticking to the same routes that they use in their car. With the right planning, bicyclists can significantly cut down on their commute time compared to using a car. Paul Brewster is the Project Manager on the Thurston County Bike Map, now in its sixth edition. The map covers nearly 80 miles of bicycle lanes and 57 miles of paved shared use trails like the Chehalis Western and Yelm-Tenino Trails. Beyond that gem, the map also provides bicycle-specific information to help you know your route before you get there, sections that are a bike corridor or have a wide-shoulder. For rural or recreational riders at risk of losing phone coverage, TRPC also provides a Thurston County GPS Map that downloads the data on your smartphone so you always know where you are – and for those Capital Forest adventurers, how to get out. The TRPC website can also help you with traffic laws and safety tips, and report a problem on a road impacting bicycle safety. Chris spends a lot of time thinking about ways to improve people’s health and the Bicycle Commuter Challenge ties together so many aspects of what makes a healthy community. To get started, Paul recommends connecting with co-workers, stopping by a bike shop for advice, or joining one of the many bicycle groups in town. The TRPC website has a list of resources you can check out here. 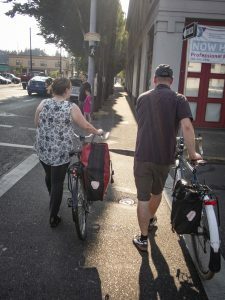 Make plans to join other bicyclists, neighbors and friends, at the Earth Day Market Ride on April 20, for a fun ride from your neighborhood to the Olympia Farmers Market. Find out more and register to ride at the BCC website.